Dir: Andrei Tarkovsky | Soviet Union | 1966 | 183 mins. There's a running joke between my daughter, partner and myself that when we're deciding on a film to watch of an evening, I always say how about a four-hour Russian black and white movie? They always sigh, and say no. The four-hour Russian black and white film I'm always referring to is Andrei Rublev (actually just over three hours long but I exaggerate for effect). I first watched it aged 18 as an art student, and watched it again recently. 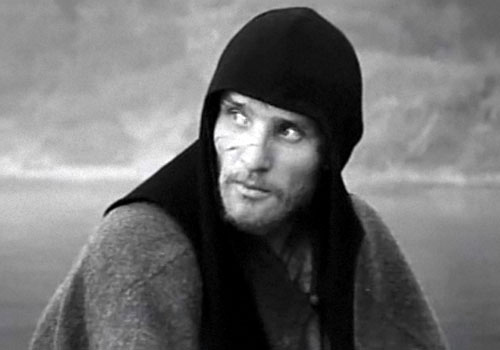 Maybe it's the black and white combined with the brutally realistic depiction of medieval Russia but I look on the film as a virtual documentary on the life of the icon painter Andrei Rublev (circa. 1360-1430) though at least 90% of it is presumably made up, seeing as little is known of his actual life. Nevertheless, it feels a truthful, spiritual, and profoundly moving experience watching the film as we follow the monk Rublev (played by Tarkovsky regular Anatoly Solonitsyn) wandering the harsh Russian landscape looking for work as an icon painter and encountering naked pagan rituals, brutal Tatar raids, famine, war and, finally, the casting of a giant bell, where Rublev breaks his vow of silence and desires to return to painting (he'd had years of self-doubt, questioning the role of the artist in society and the point of art amid so much war and bloodshed). The epilogue is the only colour segment of the film, where we see close-ups of Rublev's paintings. However, not a lot of actual painting is seen during the film (so, no, it's not like watching paint dry). In fact, the guy doesn't even so much as pick up a paintbrush in over three hours (though there's one scene when Rublev is seen sketching an icon). For those looking for the clues to his genius, there is none. It's more like an anti-biopic. After two hours he goes on a vowel of silence. Then gives up painting altogether. In old age he becomes an extra in his own biopic (doesn't that happen to us all eventually? We just become an extra in our own life?). When I went to Russia a few years ago, aside from the churches and brutalist Soviet architecture, the main thing I wanted to see was Rublev's paintings in the flesh. And they were stunning and beautiful, the colours still fresh and bold. The film had haunted me for many years, and it felt a profound experience to see the paintings, which no doubt I wouldn't have heard of if it wasn't for the film, over twenty years after first watching it. PS - Rublev takes 'a vowel of silence'? Like it! I love Parad too, though he's more hard work than Tarko. You'll be a wreck after a double bill of those two and need a serious dose of Eastenders. While I know what you mean, EastEnders is plain awful, and hard going to boot. I'll take a day of Tarko &/or Paradjanov over five minutes of EastEnders any day of the week. Hadn't realised you'd covered Paradjanov here before. He really did suffer simply for being gay. It's not like he'd killed anyone or something. But you could get banged up for that in a nominally civilised country within our lifetimes. Horrifying, really. Yes well it was illegal here in the UK up until 1967.